“NUTCRACKER” features Isabella Franco, Park La Brea, center, as the Snow Queen in 2014. This year she dances the role of the Sugar Plum Fairy. A handsome prince, dancing snowflakes and a child’s toy nutcracker come to life in this seasonal favorite—“The Nutcracker”—performed by students in the Marat Daukayev School of Ballet. Boys and girls through teen-age students at the Miracle Mile-based school will dance five performances at the Luckman Fine Arts Complex at Cal State Los Angeles. Showtimes are Fri., Dec. 11 through Sun., Dec. 13. Performance times are Friday at 7 p.m., Saturday at 2 p.m. and 7 p.m., and Sunday at 12:30 and 4:30 p.m. Some 90 percent of the students at the school, located at the Dance Arts Academy on S. La Brea, are from the neighborhood, said Pamela Daukayev. Graduates have gone on to posts at the Zurich, Stuttgart, Vienna, Geneva, Des Moines and Tulsa ballet companies. 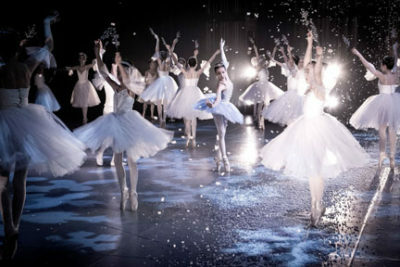 Some continue at schools at the Royal Ballet in London, Princess Grace Academy in Monaco and the Bolshoi. The inspiration behind the troupe, Marat, was a soloist with the Kirov Ballet before he opened the school in 2001. The couple’s daughter, Emma Daukayev, 13, who lives with her parents in Windsor Square and is an 8th grader at Immaculate Heart Middle School, has several roles in this year’s production, including the role of the Snow Queen. Also training at the school since she was 3, Isabella Franco, 15 and a 10th grader at Marlborough School, will dance the leading role of the Sugar Plum Fairy at the Sunday 12:30 matinee. “Five Mashas” (aka “Clara”) include two Hancock Park residents and Marlborough School students: Judith No, an 8th grader, and Eva Eisendrath a 7th grader. Eisendrath is dancing her eighth “Nutcracker” and has attended the school since she was five.